Mix the lamb with the cumin, shallots, garlic and season. Shape into 4 patties and chill until ready to cook. For the marmalade, heat a tablespoon of the oil in a small frying pan, add the onion and cook gently for 15 minutes until softened but not browned. Stir in the sugar and vinegar and continue to cook gently for 5 minutes until golden. Preheat the grill. Brush the burgers with the remaining oil then grill for 5–6 minutes each side until the burgers are cooked through. Toast the rolls and arrange a handful of rocket on top then sit a burger on the rocket with a spoonful of the onion marmalade. Try Ras el Hanout spice mix in place of the cumin in your lamb burgers. 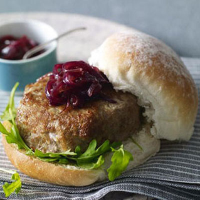 Lamb burgers are delicious with a red that has a hint of spice alongside ripe fruit flavours with a well-balanced structure: Waitrose Douro Valley Reserva Quinta da Rosa, Portugal. This recipe was first published in January 2011.